Тема в разделе "СКАМ", создана пользователем andkrs, фев 10, 2019. CROWD LENDING LTD +0.5 Received Payment 0.5 USD from account U18767850. Memo: API Payment. Payment to user Fairmonitor from CrowdLending.live. CROWD LENDING LTD +1.00 Received Payment 1.00 USD from account U18767850. Memo: API Payment. Payment to user Fairmonitor from CrowdLending.live. CROWD LENDING LTD +2.5 Received Payment 2.5 USD from account U18767850. Memo: API Payment. Payment to user Fairmonitor from CrowdLending.live. CROWD LENDING LTD +7.5 Received Payment 7.5 USD from account U18767850. Memo: API Payment. Payment to user Fairmonitor from CrowdLending.live. 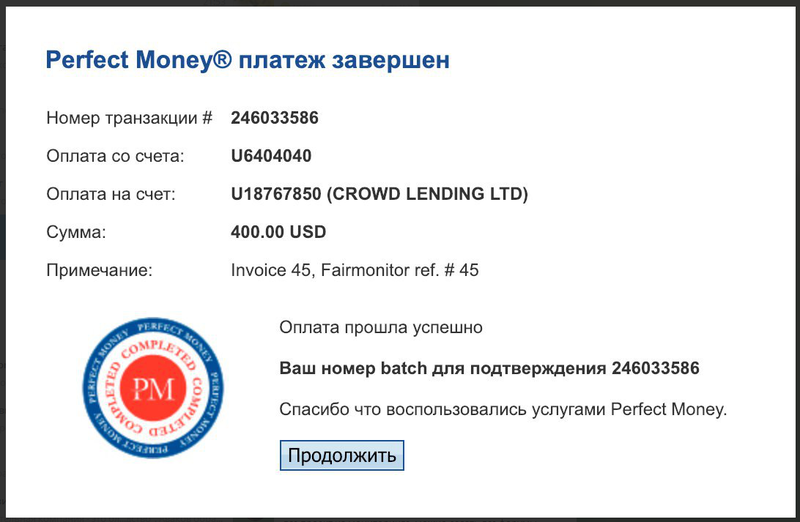 CROWD LENDING LTD +0.75 Received Payment 0.75 USD from account U18767850. Memo: API Payment. Payment to user Fairmonitor from CrowdLending.live. CROWD LENDING LTD +2.25 Received Payment 2.25 USD from account U18767850. Memo: API Payment. Payment to user Fairmonitor from CrowdLending.live. CROWD LENDING LTD +5.00 Received Payment 5.00 USD from account U18767850. Memo: API Payment. Payment to user Fairmonitor from CrowdLending.live. CROWD LENDING LTD +1.25 Received Payment 1.25 USD from account U18767850. Memo: API Payment. Payment to user Fairmonitor from CrowdLending.live. CROWD LENDING LTD +48.8 Received Payment 48.8 USD from account U18767850. Memo: API Payment. Payment to user Fairmonitor from CrowdLending.live. CROWD LENDING LTD +1.5 Received Payment 1.5 USD from account U18767850. Memo: API Payment. Payment to user Fairmonitor from CrowdLending.live. CROWD LENDING LTD +0.65 Received Payment 0.65 USD from account U18767850. Memo: API Payment. Payment to user Fairmonitor from CrowdLending.live.